Han Solo’s stand-alone movie fills in more gaps in the Star Wars universe, it’s a fun ride for fans but was it really necessary? 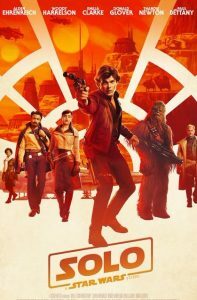 Solo is a workmanlike heist caper set in the Star Wars universe some time before the events of A New Hope (Star Wars Episode 4) which fills in several blanks in the life of everyone’s favourite roguish smuggler but one question for casual fans has to be – does Han Solo need to have his mysterious past illustrated like this? And is this film catering a bit too much to die-hard Star Wars fans after the controversy over Episode 8 – The Last Jedi? The basic plot seems to involve a heist from the infamous mines of Kessel and moving a McGuffin from one place to another with a strict time limit – thus making the run in the shortest possible distance. That’s not the only call-back from earlier Star Wars films as we see some of Solo’s formative years and his motivation going forward packed into some decent action set pieces. A pity then, that the plot is fairly ordinary, with little peril (given that it’s a glorified prequel with homework required to get the most out of it) and extra characters who are given precious little screen time and therefore it’s hard to gain any sympathy with them. Some of the new characters on the scene are well played, with special nods to Woody Harrelson as Han’s mentor Tobias Beckett with Emilia Clarke as Qi’ra and a deliciously villainous turn by Paul Bettany as crime boss Dryden Vos. Solo has had a chequered production history, with multiple reports dogging the film which has seen the original directors Phil Lord and Chris Miller (The Lego Movie) removed from the film and experienced director Ron Howard brought in to reshoot much of the film to more closely follow the straight heist team-up that was envisaged by legendary Star Wars script writer Lawrence Kasdan. Unfortunately, the story is quite weak in parts, despite the prospect of fans revisiting the characters of Chewbacca and Lando Calrissian but while the great chemistry between Ehrenreich’s fast-taking, cocky Solo and Chewbacca (played by Joonas Suotamo who has portrayed the Wookie since Episode 7: The Force Awakens) is well judged. Donald Glover’s laid back Lando seems to have come from another film, especially when paired up with L3-37 – his droid – played by Phoebe Waller-Bridge. There’s plenty of fan service going on in Solo for those who are clued up enough to follow it – some subtle, some not so subtle – in terms of cameos, lines and call backs, including a hints for potential direction for the mini Star Wars universe that seems to be emerging in the 20 year time span between Episode 3 and Episode 4. News of the announcement of a Boba Fett movie with James Mangold (Logan, 2017) confirmed as director was released today, perhaps a sign that positive Star Wars news is expected to be thin on the ground this month to possibly mitigate from any box office weakness by Solo. Rogue One, not without its own production difficulties, has kicked off a potentially rich vein of storytelling and Boba Fett and Han Solo, perhaps along with Obi Wan Kenobi, could easily serve to fill in more of the gaps that fascinates fans but Disney will have to work harder to ensure that the Star Wars franchise isn’t harmed by the release of ordinary films. The next Solo movie might benefit from a more risk taking director and a better story despite being limited to having to fill in certain blanks in a certain way. Summary: A STAR WARS STORY is a sci-fi action adventure in which a street-wise outlaw teams up with a group of smugglers to plan a heist. This entry was posted in Shooting The Breeze and tagged film review, Han Solo, Solo - A Star Wars Story. Bookmark the permalink.